Humpty Dumpty Institute : Congressional Delegations, 38th Delegation to the U.N.
< 39th Delegation to U.N. The Humpty Dumpty Institute hosted its 38th Congressional Staff Delegation to the United Nations (see participant list) on Friday, December 2nd, with the global condition of women’s and children’s health as its focus. 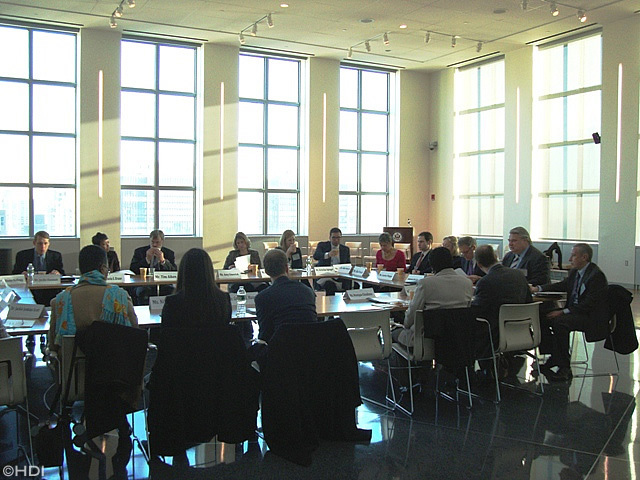 The United States Mission to the United Nations (USUN) hosted a working breakfast in which U.S. Ambassador and Alternate Representative for Special Political Affairs, Jeffery DeLaurentis discussed the importance of the U.N. Security Council (UNSC) to U.S. security policy. He explained how the Security Council is a crucial element in supporting U.S. goals on conflict resolution and human rights abroad. Ambassador DeLaurentis was joined by Laurie Phipps from USUN’s Office for the Economic and Social Council who discussed how the U.N. is instrumental in working to reduce infant mortality and the death of young children. Following the breakfast, the delegation walked across First Avenue to United Nations Headquarters. 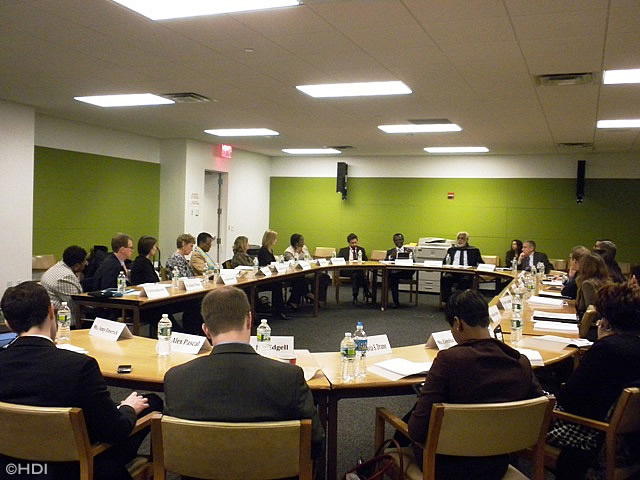 Mr. Parfait Onanga, Director of the Office of the Deputy Secretary-General, and Mr. Kishore Mandhyan, Deputy Head of the Political Unit of the Office of the Secretary-General, detailed the U.N.’s wide range of interests from the political to the developmental. They informed the group that over 75,000 people around the world are employed by the United Nations and that the organization has a budget of $20 billion. The Congressional staffers found the discussion of the United Nations’ promotion of green economic growth in order to advance economic progress and social equality a highlight of the presentation. The next presentation was offered by Dr. Yves Bergevin, Senior Maternal Health Advisor and coordinator for Maternal Health Thematic Funds at the United Nations Population Fund (UNFPA) and Ms. Susan Myers, Vice President for U.N. Relations, United Nations Foundation. The participants learned that in addition to being a tragedy for individuals, maternal deaths are also devastating to the economic development of families and communities. Susan Meyers discussed UNF’s longstanding relationship with the Secretary General’s office and how it is currently directing resources to the SG’s projects on maternal health. A panel composed of Asger Ryhl, Yassine Fall, and Christine Arab, from the Office of UN Women discussed their work in the most recently created UN office. 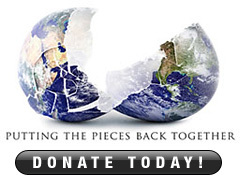 Less than a year old, U.N. Women promotes gender equality and female empowerment in the U.N.’s 193 member States. The office lobbies for national laws which are designed to protect the rights of women and also coordinates U.N. gender related programs implemented by the diverse U.N. Specialized Agencies. The delegation then took a private tour of the United Nations General Assembly building to get a better understanding of the Capital Master Plan, which is renovating the United Nations campus for the first time in its 66 year history. 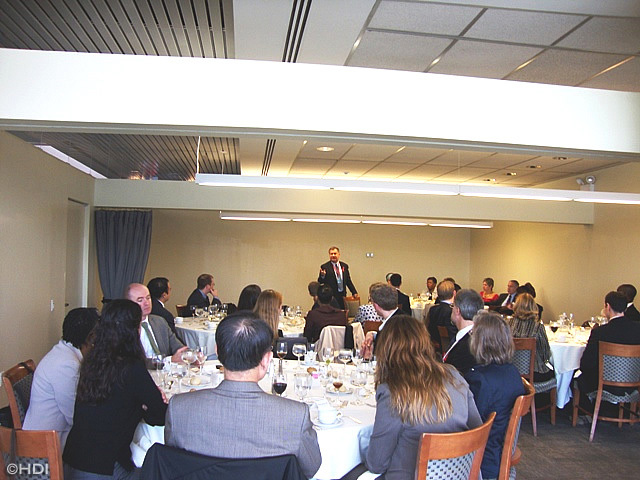 The tour was followed by a working lunch in the U.N.
Delegates Dining Room. The luncheon speaker was the Director of the New York Office of UNAIDS, Dr. Bertil Lindbald. He discussed how the U.N. must continue to fight aggressively against the HIV virus which causes AIDS. Despite many successes in sub Saharan Africa where transmission rates have fallen, Russia and other countries are seeing a rising epidemic.